Fairfield Warde's Clare Secrist (in white) Citizen Athlete of the Week. ACCOMPLISHMENT: Had 11 kills, six digs and six service points in a four-set win over New Canaan on April 25. Had 13 kills, six service points, five digs and three blocks in a four-set loss to Ridgefield on April 27. Had 17 kills, six service points and two blocks in a five-set win over Trumbull on May 2. 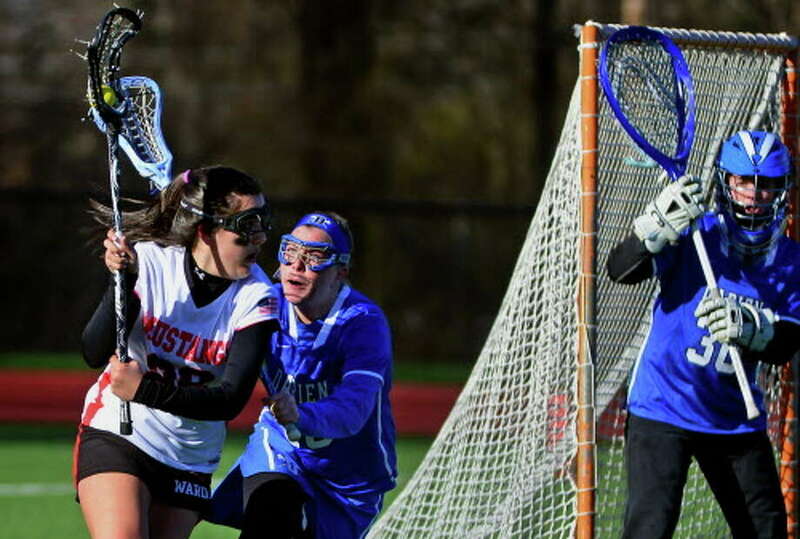 ACCOMPLISHMENT: Scored two goals in a 16-5 loss to New Canaan on April 25. Scored four goals in a 11-8 win over Staples on April 28. Scored two goals and had an assist in a 10-6 win over Canton on April 30. Had three goals and one assist in a 13-7 win over Norwalk on Tuesday. Coaches who wish to nominate an athlete for Athlete of the Week can call Citizen sports writer Chris Elsberry by 5 p.m. Tuesday at 203-400-4765 or email him at celsberry@ctpost.com.